At GENNEX it is our belief, that bringing together open minds from diverse industries in a creative setting, INSPIRE their minds for what is possible, CHALLENGE them to leave their ‘box’ and create new connections and ENABLE them with new world skills will facilitate solutions for new worlds problems and hence create new business. During two inspiring days, the premiere of GENNEX "Minds without Limits" offered 16 keynote speeches, over 25 workshops and various technology and leadership labs with a total of over 50 speakers. The disruptive setting of a business conference in a circus tent and the vibrant, creative atmosphere led to the exchange of over 8,000 contacts among participants via the klik badge, animated over 600 participants to attend a workshop, and encouraged over 700 " explorers" in the "C2 experiential Labs" to go beyond their comfort zone - with more than 400 people in the C2 ball pool. GENNEX 2018 featured many highlights with speakers like John Foley (Blue Angels Jet Pilot), Nigel Barlow (who rocked the tent), the amazing Soul Flyers (with their wingsuit jump into a plane) and many more. A special moment was saved to the end of the two days, when Prof. Muhammad Yunus (Piece Nobel Price Winner) handed over the GENNEX HUMAN FOKUS AWARD to Dr. h.c. Hannes Schmid, Founder of Smiling Gecko, for his fantastic work and role model building the first smart village in Cambodia. Get to know more here! 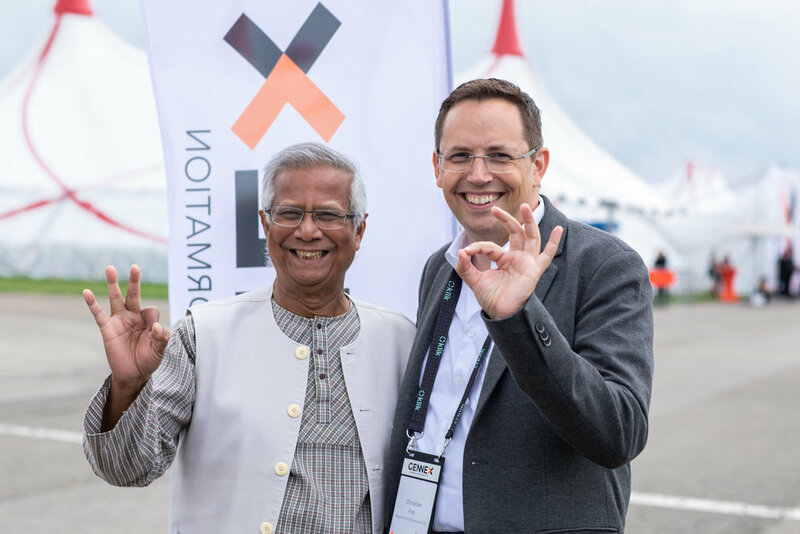 Peace Nobel Price Winner Prof. Muhammad Yunus at GENNEX 2018, thrilled about the premiere of GENNEX with Christian Frei, co-founder GENNEX and Member of the board of Gregory Knie Entertainment AG and InspiredView GmbH.